The third editon. Guaranteed to cause heated debate amongst fans of Epic. Over the lifespan of 2nd edition it slowly built up a mass of new rules and supplements that it needed a new edition. 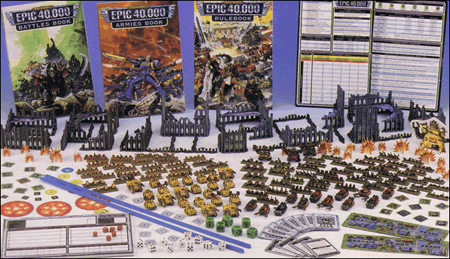 Epic 40,000 was the result and it was a commercial failure getting pulled before the full model range was released (many planned chaos releases never made it in to production, specifically the dreadnoughts, bikers and the Banelord titan). The game itself is very good, but when compared with previous versions it fell short. Many units were bland, while many players found that a huge swathe of miniatures they owned were no longer usable in the new system. Titan Legions players couldn't field them anymore. Squat players had no official rules and many races units disappeared or became victims of the dreaded "counts-as" rule. Many Epic fans felt the same leading to a schism in the community. Some supported the new version while many others went off to develop a variant on 2nd edition - NetEpic. When it became clear that the game wasn't a success as GW hoped, it was handed over to the then newly formed Fanatic division. It was given a low level support through the Citadel Journal and Epic Firepower magazine. Firepower then became Epic 40,000 magazine which continued to offer support with new rules and ideas and the odd re-release of miniatures. The game was eventually re-released as the Epic 40,000 players edition box. I've never seen one, but assume it contains everything in the orignal box minus the miniatures and buildings.